Welcome to our home on July 4th. 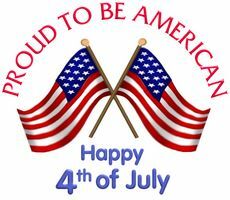 There was a day in our history when people actually spent time on Fourth of July decorations. They were homemade but sincere, and represented deep patriotism. I think that patriotism still exists today, and we can celebrate with Fourth of July decorations that are easy to put together and low cost. Here are some excellent ideas to get you started. » Pick up some red, white and blue bandannas and wrap them around your existing throw pillows, then knot in the back. You can use this indoors, or on the porch or deck. » Use red, white and blue ribbon from the dollar shop to tie up your napkins, wrap around your door wreath or create streamers of ribbon from the back of each chair. » Turn a paint stick stirrer into a Lady of Liberty (shown at right). » Print out American flags (you’ll find lots to choose from in this search for Printable American Flags on Google). Use them to cover the inside of a window. Be sure to face the flags to the outside, and fit them up edge to edge. The result is a patchwork of American flags shown from your front windows which is quite eye catching. » Buy red, white and blue craft foam from the craft store. Cut them into star shapes of three different sizes. Layer the different sized shapes onto each other and glue together. 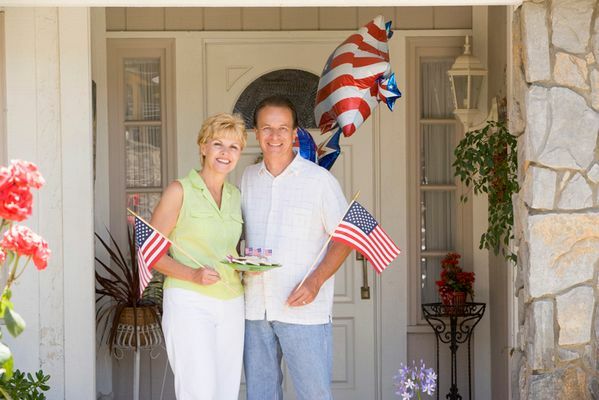 Tie the stars from porch overhangs, trees and mailboxes to let your Fourth of July decorations spread patriotic cheer! The kids will love to help with this! » Don’t leave out the kid’s teddy bears and dolls. Tie red, white and blue yarn, or ribbons, around teddy’s neck, then let him hold a small paper flag. » String white holiday lights through trees to create fireworks appeal! Drape them from porch rafters as well, or wrap around deck railing. ver coffee cans, boxes or other containers with patriotic paper, and use to hold utensils, napkins, or condiment bottles. Use your imagination, and make your Fourth of July decorations the most memorable yet!